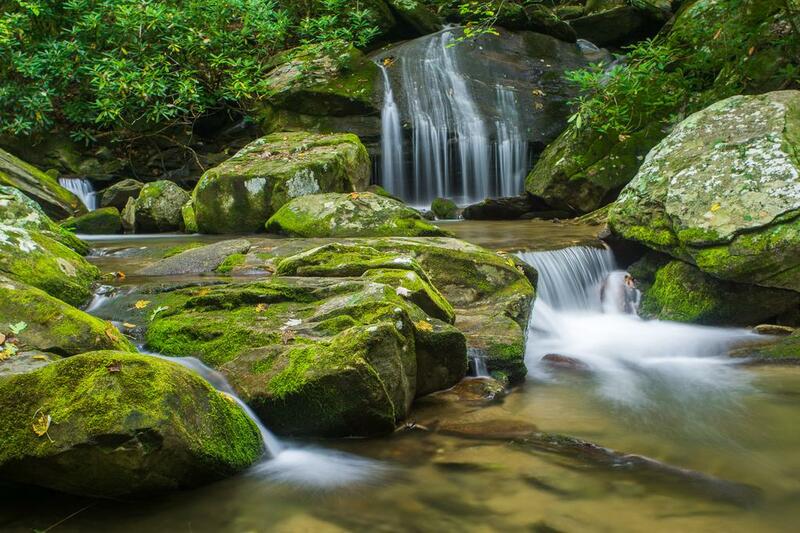 This is a high, wide series of cascades, best viewed in higher water after the leaves have fallen. Several free-fall sections are combined with rock-hugging cascades giving the falls plenty of variety and character. From Asheville, take I-240 E to I-40 E. Go just under 20 miles on I-40 to exit 73, the second Old Fort exit. Before the ramp ends, turn right onto Catawba River Road. Go 3 miles to the bridge at the end of the road. The new, large parking area is just across the bridge. 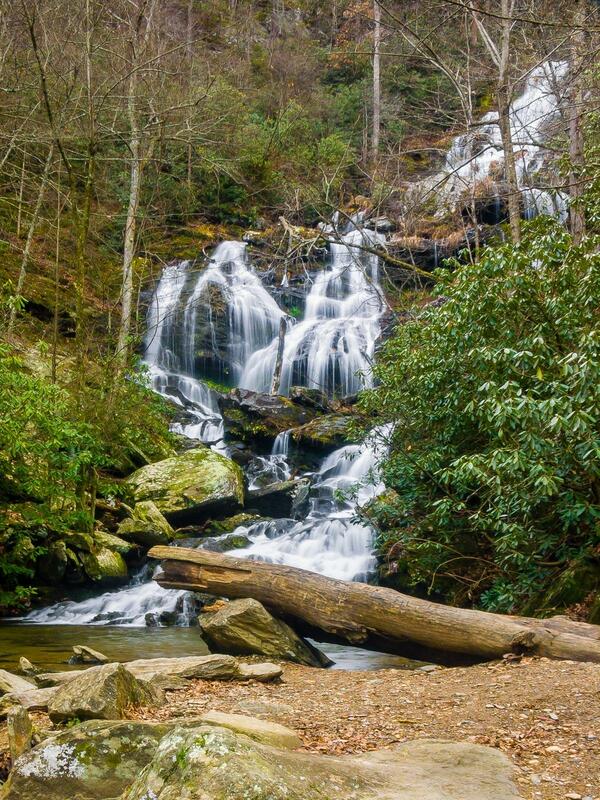 The hike to the falls is about 2.5 miles round-trip and moderate in difficulty. Unfortunately, due to extremely heavy usage and construction traffic, it's in pretty bad shape. 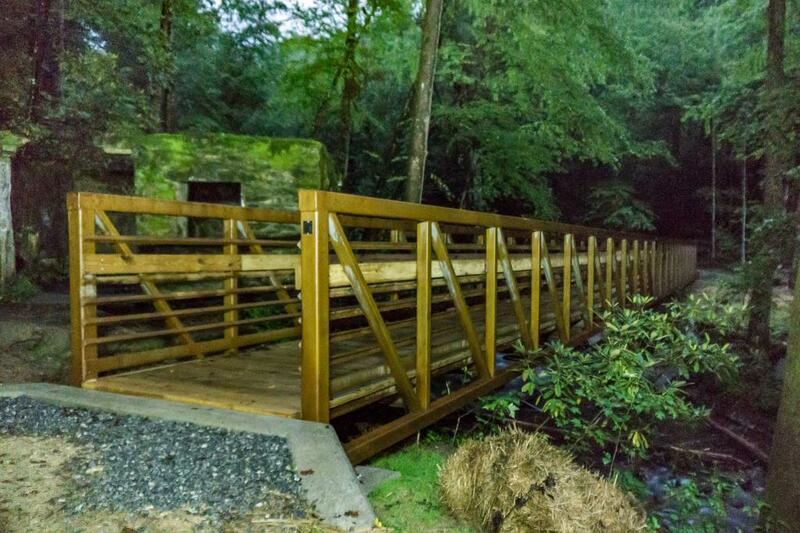 However, it's not too difficult overall, and improvements to the trail are forthcoming. The trail starts at the back of the parking lot, to the right of the sign boards. The trail joins and follows an old road bed about 1.2 miles to the falls. On the other side the trail starts climbing moderately. The river will start to exhibit some cascades, and you will pass an old hydroelectric dam. Stay off the dam and away from the cliffs in this area. 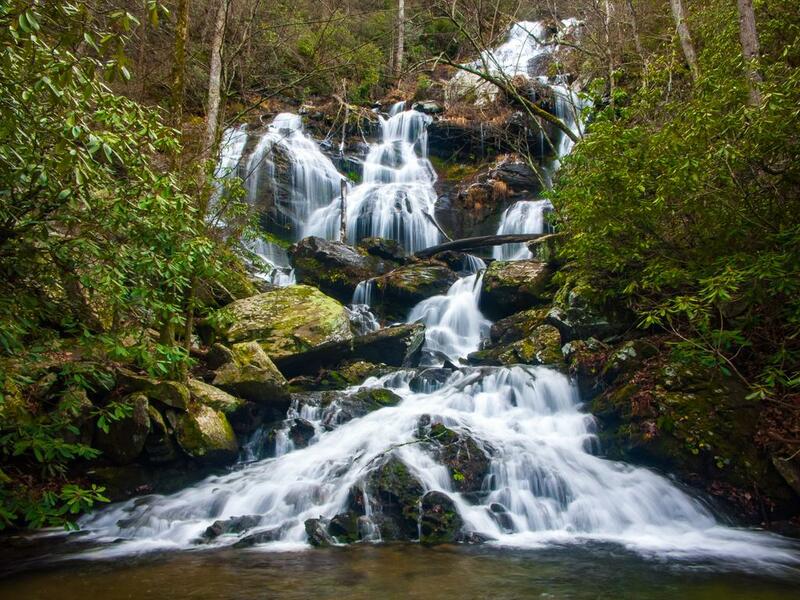 The small cascade below the old dam may constitute a third "lower" part of Catawba falls. Much of this cascade - the part most people see - is man-made and will be eliminated when the dam is removed, making them even smaller. The prettiest part of this cascade is natural, but most people don't see it due to the difficulty required to accessing it. Personally, this is far enough downstream and distinct from the main falls that I think they should have a separate name. Shortly past the dam, the trail will make an easy rock-hop crossing of Clover Patch Branch, which has its own cascades above and below the trail. Next, the trail crosses an eroded gully and then Chestnut Branch, which can usually be rock-hopped. The trail spreads out into multiple threaded paths and can be hard to follow, but just bear right uphill for a short distance and find the big log marking the crossing spot. The trail continues there. The Forest Service is planning another bridge over Chestnut Branch, which should make this more manageable. Just beyond Chestnut Branch, the trail gets a bit more difficult - you'll have to climb up and around on some rocks. The trail then ends at the base of the lower falls, where there is a somewhat decent area for hanging out and viewing the falls with a pebbly "beach" beside the pool (but be careful - there are some drop-offs and cascades just downstream). Many people continue on the "trail" that goes up the right side of the falls to Upper Catawba Falls. However, that trek is steep, arduous, slippery, and dangerous. It climbs up next to the falls where one misstep could send you over the edge. Until a better path is established (which is in the plans for this area), I do not recommend trying to reach the upper falls.